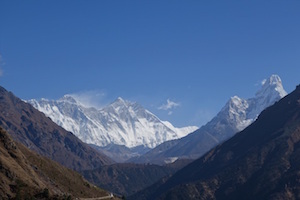 Towering high above Nepal are the majestic Himalayas, home to the tallest and most magnificent mountains on earth. In an ancient Hindu scripture, the Himalayas are aptly described as “the abode of the gods.” After hiking in Mt. Everest’s shadow through the Khumbu Valley’s remote mountain paths, it is easy to understand why the locals believe this to be a home worthy of the divine. 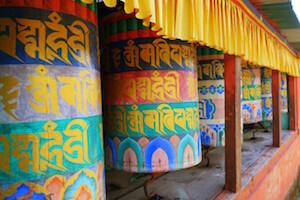 The spectacular scenery inspires spirituality and as such, this alpine wilderness is scattered with sacred temples and monasteries, prayer flags and mani stones, chortens and stupas. These man-made additions to the landscape enhance the natural beauty of the region, rather than detract from it. Nepal has long been the domain of adventurous backpackers and outdoor enthusiasts, whether they be hikers in search of the world’s most amazing vistas, or climbers looking to conquer the mightiest mountains on earth. Either way, Nepal caters to this niche market exceedingly well. With teahouses providing accommodation in even the most remote locations and thousands of professional porters willing to carry your heavy pack, they have made it possible for visitors from all walks of life to experience their outdoor paradise. As it’s our first foray into high altitude, we decide to tackle a relatively modest 60-mile hike over 10 days. At an average of six miles a day, the distances aren’t long, but we know the terrain will be challenging. 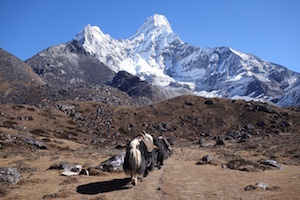 The goal we set ourselves is to reach Mount Ama Dablam’s base camp at about two miles above sea level. A distinctive steep pyramid blanketed in snow and ice, Ama Dablam is considered by many to be the most beautiful mountain in the world. We choose a “luxury” tour option, which has us staying in a chain of locally owned, superior quality teahouses called the Everest Summit Lodges. These lodges offer comfortable twin-share rooms with an en suite bathroom boasting a western toilet and piping hot shower. These basics from home are an extravagance we are extremely grateful for at the end of each day’s hiking. Our adventure starts with the infamous flight from Nepal’s capital, Kathmandu, to one of the world’s most dangerous airports. Perched on an impossibly tiny area in the mountains, Lukla is the shortest runway in the world and also one of the highest at well over a mile. Following a surprisingly smooth landing, we find ourselves immersed in some of the most spectacular scenery in the world. Whilst we had enjoyed some wonderful views of the Himalayas from the Kathmandu Valley, nothing can compare to the feeling of being fully surrounded by the highest peaks on earth. These giants of Mother Nature manage to amaze and captivate you while at the same time reducing you to a feeling of insignificance. The first day of hiking provides a gentle introduction to trekking in the Khumbu Valley as we follow the Dudh Kosi River along undulating hills and valleys. It’s a sensory overload — the remarkable landscape provides a feast for the eyes; the sound of the gushing river in the canyon below marvels the ears; and the sweet smell of the rhododendron and pine forest delights the nose. 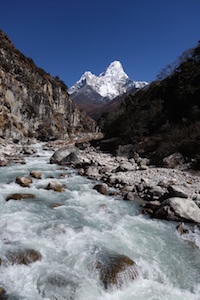 The toughest day of all is hiking to the base of Ama Dablam mountain. It’s a long, steep climb over several hours to reach the expedition climbers’ camp. We arrive exhausted but there’s immense satisfaction in reaching our pinnacle of the Himalayas, and we can now personally attest to the extraordinary and unique beauty of Ama Dablam. The personal highlight for me, though, is setting my eyes upon the highest point on earth, the peak of Mount Everest. Since my childhood, I’ve been fascinated with this mountain and people’s sometimes tragic ambitions to conquer it. We are extremely lucky to enjoy clear blue skies each and every day, providing us with constant and magnificent views of this mighty mountain. Each night as the temperature plummets we are particularly grateful for our warm, comfortable lodges with hot showers and soft beds. We rush down to the dining room every evening to fill our ravenous stomachs with a delicious three-course meal consisting of both western and local options. The staff serve us with smiles and are always quick to offer seconds and more tea. My favorite lodge, at the picturesque hilltop location of Mende, provides us with a surprise cultural show after dinner. The staff sing and dance Sherpa folk songs, before encouraging all the guests to join in. We have a fabulously fun time attempting to mimic the traditional dance moves. Throughout the trek we find all the local people to be extremely friendly and welcoming. Their simple way of life and strong culture provide a rare glimpse back in time. The complete lack of motorized transport creates an uninterrupted peaceful atmosphere which is highly refreshing. By the end of the hike we are enjoying it so much that we begin to dread returning to civilization and the hustle and bustle of Kathmandu. Nevertheless, after 10 days our trek is complete and it’s time to catch our return flight to the Nepalese capital. We enjoy a final celebratory dinner with our guide and porter, who have become our trusted friends. We share a bottle of wine with them and toast to what has been a challenging but highly rewarding journey.